On our second to last day on Kauai, we drove from Poipu, where we were staying on the south shore, to the north shore of the island. While the entire island is very tropical and green, there is a notable difference between the south and north sides. The north side is the windward side and you can tell that the level of precipitation is much higher. There is one main highway that runs around the island and it took about an hour and a half to go from Poipu to Princeville. The view from my aunt and uncle’s rental condo in Poipu, looking inland towards the mountains. 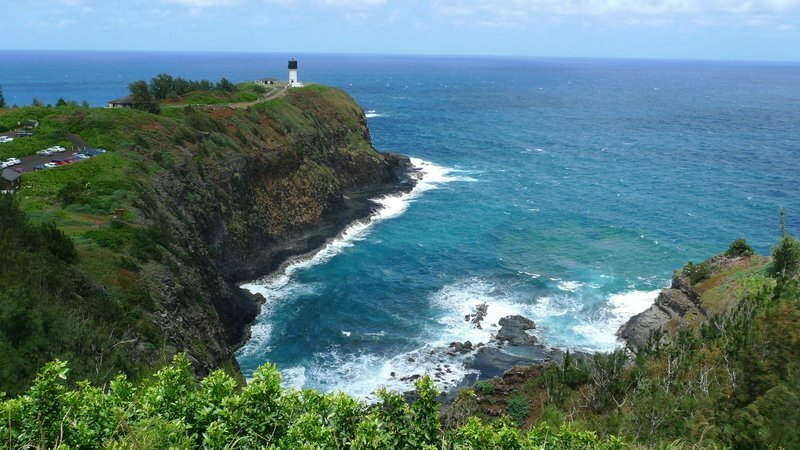 Our first major stop was Kilauea, a small plantation town that is home to this lighthouse situated on a dramatic bluff overlooking the Pacific Ocean. 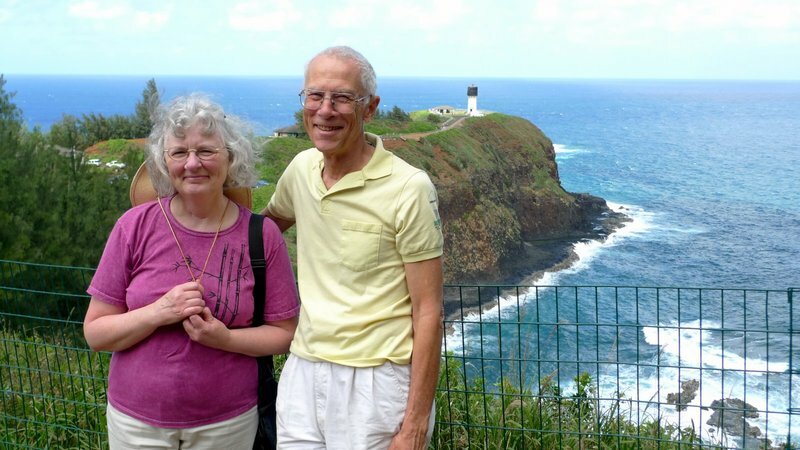 One item on our itinerary that we were not able to fit in was a stop to the Kauai Kunana Dairy, a small family-run goat farm and micro-dairy in Kilauea that makes fine goat cheeses. They offer tours but only on Thursday. A future visit will have to include a stop there. My parents in front of the lighthouse. I remember visiting here in the 80s as a family. We continued our drive through Princeville, then stopped at a scenic overlook before descending into Hanalei Valley. 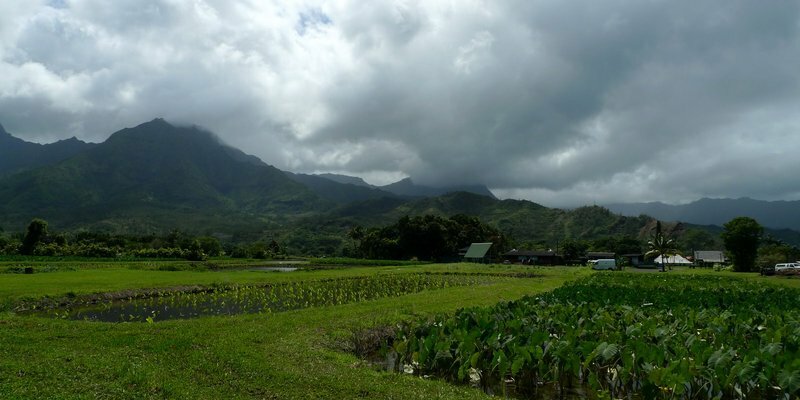 This is the view of the taro fields in Hanalei Valley. Such pretty shades of green. As we descended into the valley, we were able to get closer to the fields themselves. 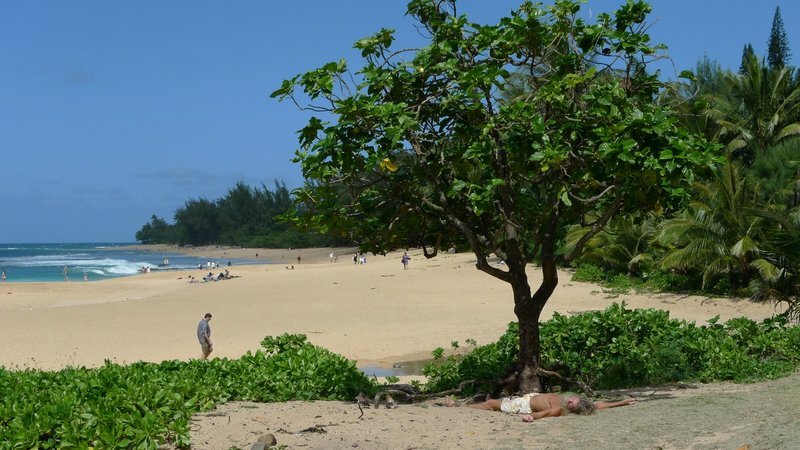 Hanalei is a small beach town of surfer dudes and the hippie vibe has not faded. The reasons for the reference to the town of Hanalei in the song “Puff the Magic Dragon” are easy to understand. While in Hanalei we stopped at a small shopping center that featured shops selling local crafts and souvenirs. 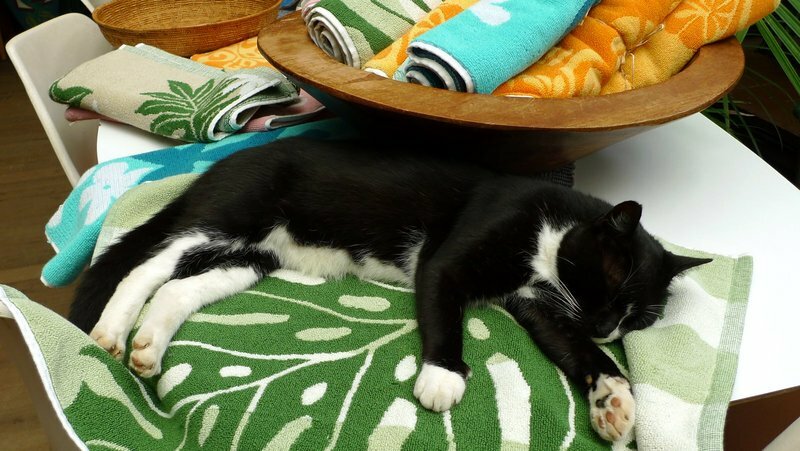 This one had this pretty cat napping amongst the towels. He looked too comfortable to disturb. 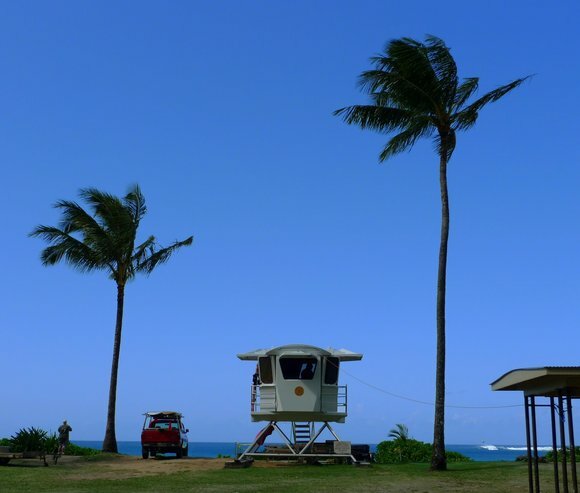 We worked our way along the highway, making a few stops here and there, until we came to a point that overlooks Wainiha Beach Park (pictured above) and Wainiha Bay (below). You have to park at a cut-out on the road, being careful to give plenty of room to passing cars. Then there is an easy climb just a few feet down a hillside to the lava rocks, which give a great view and put you just above the reach of the waves. Looking back at the beach in Wainiha Bay. Tranquil, isn’t it? 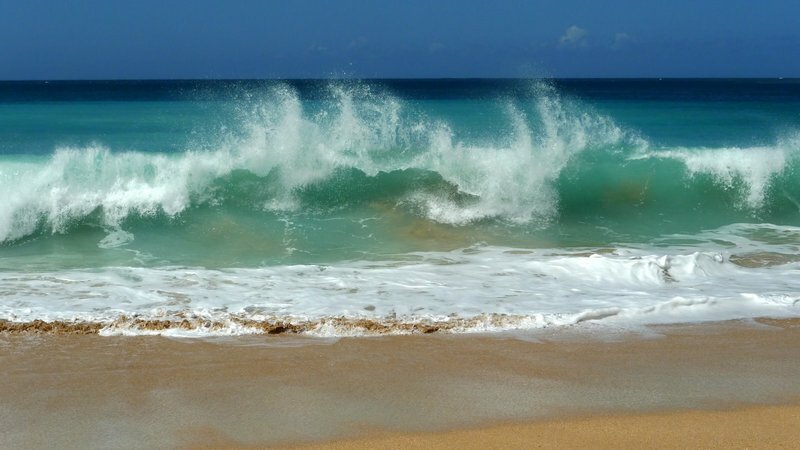 Tawn takes a picture as waves crash with Wainiha Beach Park in the background. We continued all the way to the end of the road at Haena State Park. Since we weren’t planning on doing any hiking on the Kalalau Trail along the Na’Pali Coast (and couldn’t find any parking in any case), we backtracked to Makua (Tunnels) Beach, a wide stretch of sand where we managed to run into my newlywedded cousin and her family. At Makua Beach, I saw this man lying in the sun, Christ-like in pose, beard, and dress, looking like a sun-chasing hippie that might be fried in more ways than one. Birds pecked around him and I can only assume that the lifeguards were aware of him and knew him to be alive. Tawn practices writing his name in the sand. And then sees his identity washed away by the waves. The noth shore is very beautiful and while none of the four of us (me, Tawn, and my parents) are sun-worshipers, it was hard not to appreciate the beauty of the beaches. Here’s a video I made that combines clips I shot from the north shore as well as other scenic sights on the island. Not only is the footage beautiful, but the music, a contemporary Hawaiian song titled “Manauleo” by Keali’i Reichel, Uluwehi Guerrero, and Kekuhi Kanahele is well worth a listen. This entry was posted in Uncategorized and tagged bay, Beach, Hanalei, Hawaii, Kauai, Kilauea, Lighthouse, Makua, North, Princeville, Shore, Taro, Wainiha by christao408. Bookmark the permalink. Spectacular scenes! Again, those photos of Tawn are worthy of a magazine shoot! 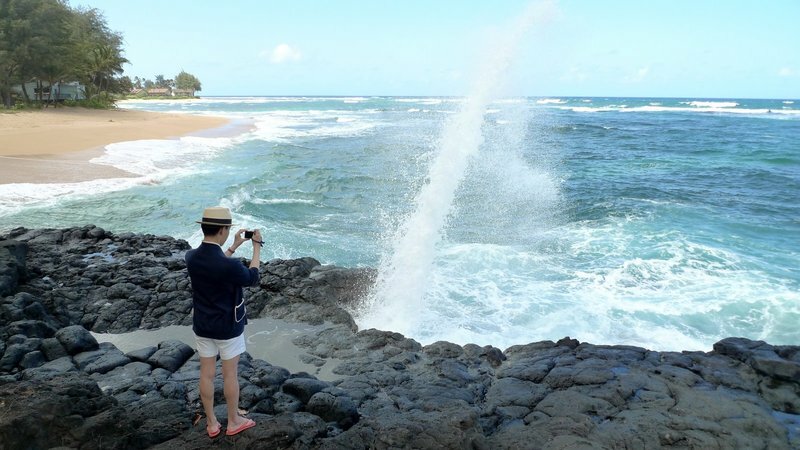 Thanks for sharing the sights and sounds of Kauai! what is that white elevated hub thing next to the red truck? i could TOTALLY live in something like that! especially with the scenery of hawaii. =) great pics! I liked this one… the shot of the cat made me smile. By the way – you do look extraordinarily like your dad… I can def. see the family resemblance. 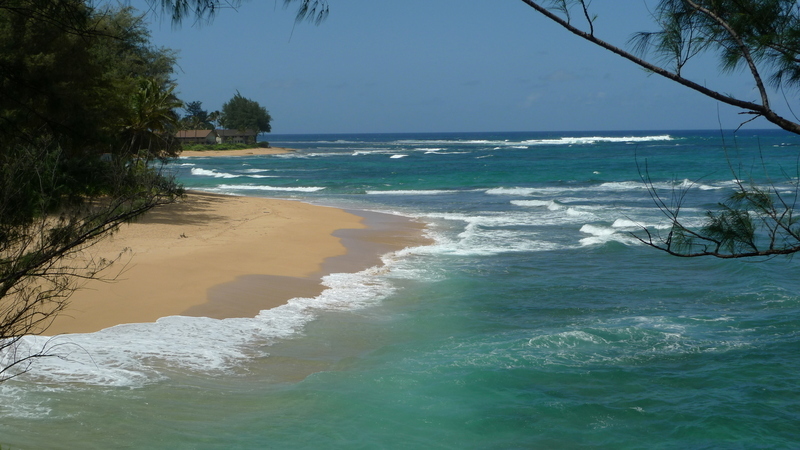 My wife and I went to Kauai for our honeymoon… it was spectacular, and we want to go back. I remember most of the areas you took photographs of! Hiking is definitely on our itinerary when/if we go back.Thanks for sharing! Beautiful video that just sums up the wonderful environment through which we traveled. The music was so appropriate as well. What made the trip particularly exceptional, however, was the people we shared the occasion with. Thank you for the journey. Beautiful photos and magnificent scenery. I have been yearning for just that – some color and the ocean. Blessings from the North Country. @kunhuo42 – More than anything, it was a function of the length of the song fitting with the content I had. Plus it is a beautiful song. I love the pictures – the skies are so blue and the fields are so green. Thank yo for the video and the wonderful song. It really held my attention. I had no idea that Hanalei is the Honahlee in the song. You’re making me want to go to Hawaii so badly. I’d love to sit on that beach all day (under an umbrella, hat, sunglasses and two gallons of SPF 50). Loved all those great photos and now know another place I want to see before shuffling off this mortal coil as the Bard would say! Thanks so much….and I agree….your parents are a cute couple! 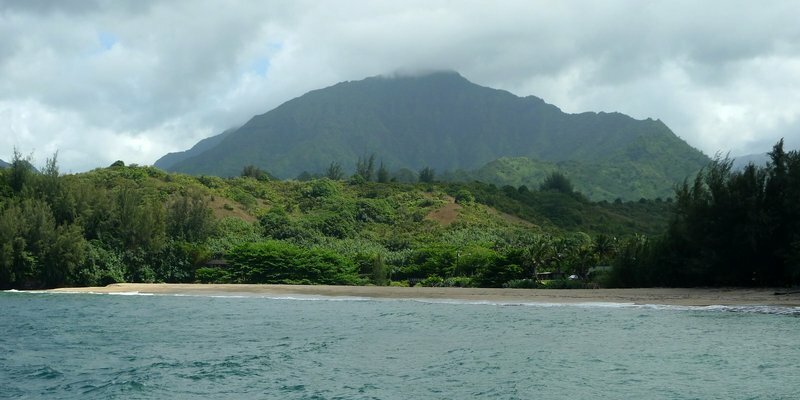 @Gma_Joyce – You haven’t been to Kauai yet? Oh, you most definitely should add it to your bucket list.